Summer in Northeast Arizona gets pretty hot, like over 100F degrees every day sort of hot! It is quite dry though so sweat evaporates immediately which keeps you feeling cooler than it actually is. In June and July it is not unusual for it to be 110F. Working away at 2 PM, in the sun, it still feels bearable. Since the Earthaware program has us creating outside in these conditions we have to be very aware of covering up, taking lots of breaks and hydrating with clean drinking water almost continually. The kids of the STAR School near Leupp, Arizona know all this of course, they grew up in these conditions. It’s the pale instructor, formerly of Portland(rain), Oregon who must be reminded… by the kids of course… to hydrate and cover his arms and bald head. Teachers should always be open to being taught by their students. 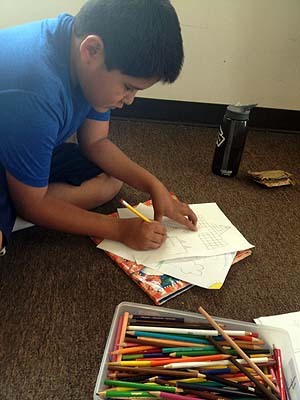 Summer School 2013 at the Navajo STAR School was two weeks of Earthaware curriculum overlaid on the foundation of the schools four R’s foundation: Respect, Responsibility, Relations and Reasoning. The kids at STAR are introduced to these four principles upon entering the school in kindergarten, they are the tenants of Navajo peacemaking which has been taught in the culture for centuries. In our summer school program we focused on the third R: Relations, as the link between the individual, the team, community, country, species and all other benign and living things on Earth. We did this through a series of team art projects. We started by contacting the folks at the Flagstaff Municipal Landfill asking for freshly dumped green, flexible sticks and branches from local landscape maintenance outfits. 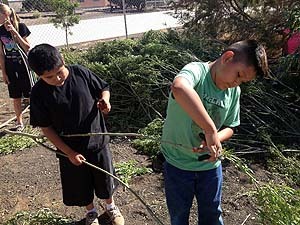 They said they had a ton and to come down anytime to gather what we wanted for the school project. Normally such materials are just ground up and used as composting layering material for the plowed-under garbage in the landfill. 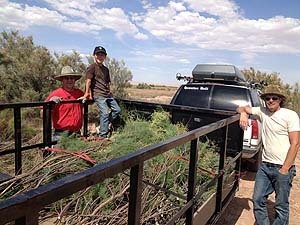 We loaded a trailer up four feet high by 12 feet long mostly of ash, some sort of willow and some ponderosa pine and hauled it all back to STAR. Next we visited the Leupp Family Farms area on the flood plains of the Little Colorado River in the town of Leupp to harvest brush. The areas we cleared are to be the next fields for the farm and are adjacent to where they are now replanting traditional blue corn, an historic staple of the Navajo. Our gathering efforts for the school project partially helped the farm open up new arable land. With plenty of organic material to work with we next raided the STAR School kitchen for cardboard boxes, plastic packaging and other reuseables. Summer School was now ready to begin! 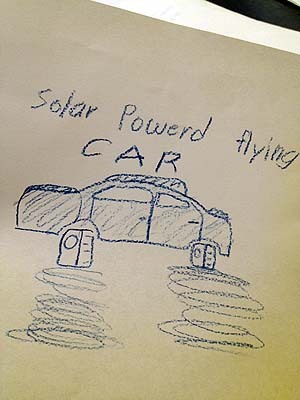 First we spent a few hours drawing impressions of Mother Earth, all things that came to mind. 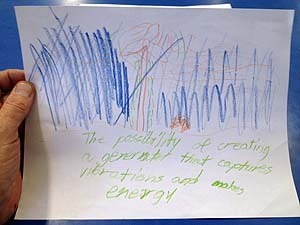 They drew trees, animals, landscapes and people. We talked about how all these elements work together, what can effect their health and how we can assure that all these souls can live in harmony. We had been asked to do the exterior work in and around the school garden. Looking over the space we saw an opportunity to create an outdoor, shaded area and to paint Earth inspired forms on some surfaces. With dappled shade over the space it would be ideal for outdoor teaching and just hanging out. There was a nondescript steel tool shed at one side and the schools' straw-bale classroom building on the other. 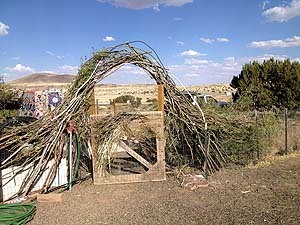 The materials we gathered lent perfectly to constructing our version of a traditional Navajo shade structure, examples of which can be found across the Navajo Nation made from lashed poles and branches. So we started as all Earthaware projects do by gathering our focus, stretching our bodies then discussing safety and tools handling procedures. The 35 kids divided into two main groups, half went with guest artist Bill Dambrova to the art department and came back with water based acrylic paints, brushes, cups of water and rags. Bill assisted and provided leadership to the painters of the group for most of the program, he went home each night with extra colors on most of his surfaces. The other half set about clipping the branch pile into manageable lengths. To start any structure we must think of how big it will be and how the weight of the materials we use will be supported. For our shade structure we selected the thickest and medium sized branches first and the kids set about fastening them between the straw bale building and the shed. We don’t tell the kids exactly what to do on these projects, we discuss our group ideas in general terms of what we wanted to collectively accomplish then let them experiment and figure out for themselves how to go about it. First they tried just stacking the sticks in place, then taping, then finally wire wrapping the horizontal members across the span which seemed strong enough. They put the thickest branch vertical in the center of the span as a column: wow - young architects! While the shade builders were at it the painters started a mural on the shed, on all sides of the shed including the roof! Then the adjacent garden wall, then some walls on the straw bale building, more sticks, more shirts and... it was time to stop the happy painting and look at the zoological masterpieces they had made. They created a virtual cornucopia of beings: insects, animals, plants and "beings" of unidentifiable sources. 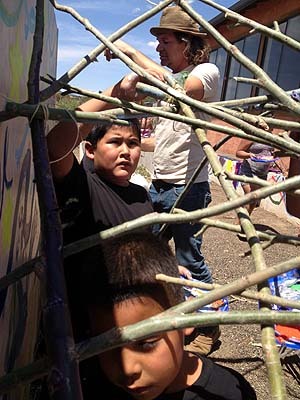 for several hours each day over the course of the weeks we assembled our materials into a functional, modified Navajo shade structure, painted away at the bare surfaces and even painted the sticks that we used to weave with. We also wove an arch over the garden entry gate and enhanced the garden gate itself. All this while learning and talking about the environment and the effects that we all have upon it, what works and what does not work in it. Our finale was an afternoon back at our drawing. 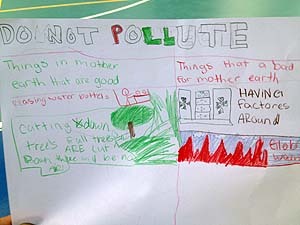 The kids took the lessons of the building, the discussions of what we learned and created images of solutions to help Mother Earth be healthier. The results are quite amazing!